Donald Trump continues to suffer from upside-down job ratings as his second year as president winds down. 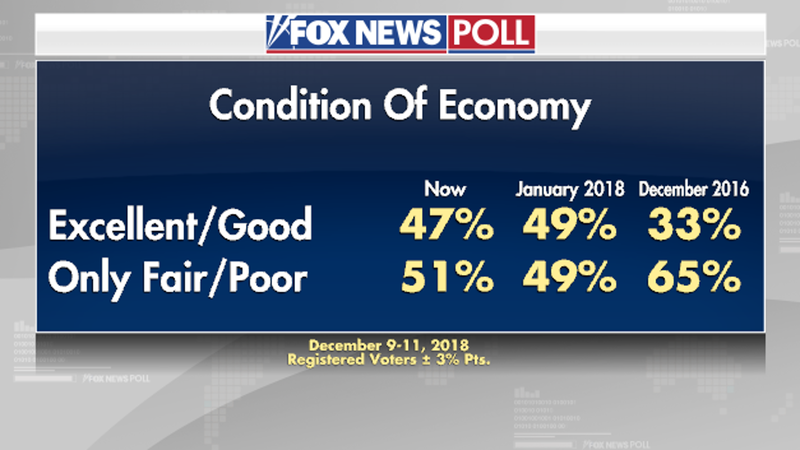 In addition, views of the economy remain divided, voters feel the administration’s economic policies have not helped them — and fewer are optimistic about future economic conditions than two years ago, according to the latest Fox News poll. Forty-five percent of voters think the economy will be in better shape a year from now, down from 56 percent who felt that way in December 2016. Although the question has been asked at irregular intervals on the Fox News poll over the past 20 years, this is the most pessimistic outlook since February 2001. Republicans are three times more likely than Democrats to say the economy will be better next year, and seven times more likely to say they have been helped by Trump’s economic policies. 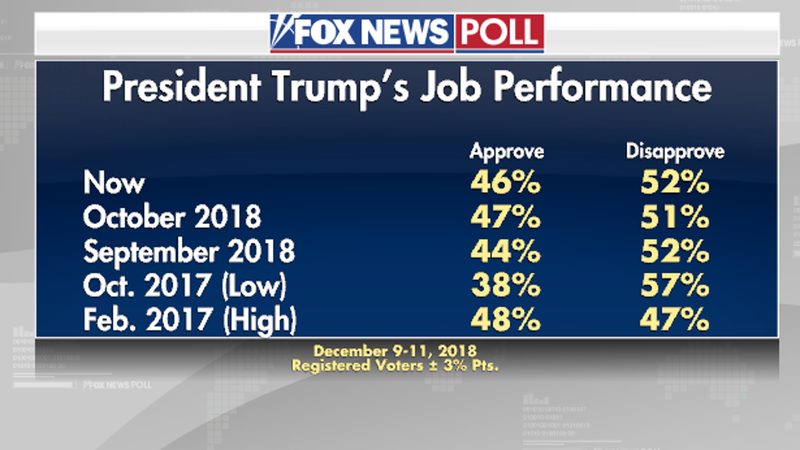 Again this month Trump gets his best marks on handling the economy: 50 percent of voters approve, while 43 percent disapprove. On border security, it’s 46-49 percent, and on immigration, it’s 43-53 percent. On voters’ top concern, health care, the president is underwater by 23 points: 33-56 percent. Overall, 46 percent of voters approve of the job Trump is doing and 52 percent disapprove. In January, it was 45-53 percent. Moreover, approval has barely budged all year, staying within the narrow range of 43 to 47 percent. Currently, 47 percent say the economy is in excellent or good shape, while 51 percent call conditions only fair or poor. That is mostly unchanged since January (49-49 percent). However, it is a significant improvement from when President Trump was first elected and two-thirds rated the economy negatively. it depends who pol ?s are put to…..I tend to think they’re much higher than reported = prob. polling the dnc.